CVIA, PES, and IO were the worst performers in Q3. CVIA has cut down frac sand production capacity. PES face concerns over rig utilization and pressure pumping demand. IO has various short-term operational concerns. 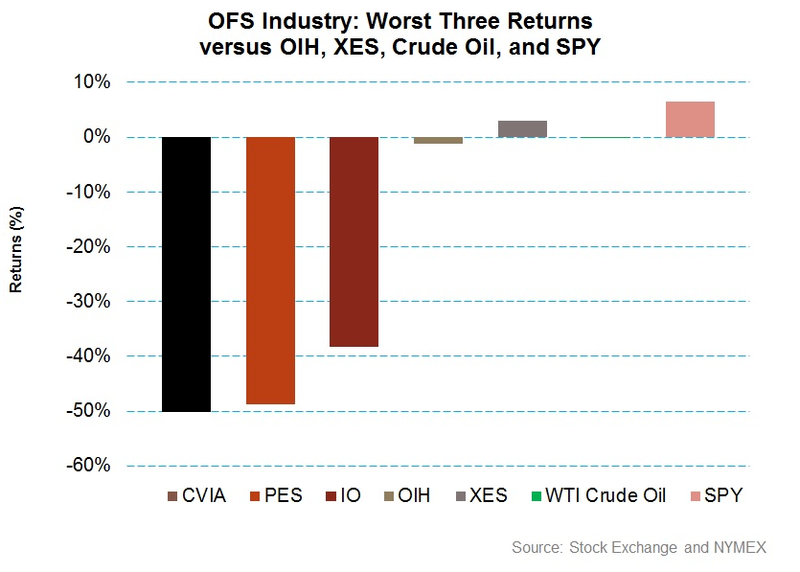 Since the start of Q3 2018, many companies in the oilfield equipment & services (or OFS) industry have had negative returns in the stock market so far. In this series, we will analyze the worst three companies in the OFS industry by stock market returns in the past three months. However, this analysis excludes the offshore drillers. I have selected 39 OFS companies that are part of the VanEck Vectors Oil Services ETF (OIH), the SPDR S&P Oil & Gas Equipment & Services ETF (XES) as well as a few names outside these ETF holdings. From June 29, 2018, until October 8, 2018, Covia Holdings Corporation (CVIA) saw the deepest fall in stock prices in the OFS industry. CVIA provides proppant solutions, additives, and coated products to the energy industry. It also provides diversified mineral solutions to the glass, ceramics, coatings, construction, water filtration, and recreation markets. Compared to CVIA's 50% fall in this period, the VanEck Vectors Oil Services ETF witnessed -1.3% returns. OIH tracks an index of 25 OFS companies. Pioneer Energy Services Corporation (PES) saw the second highest dip in stock prices in the OFS industry. Since the beginning of Q3 2018, its stock price decreased by 49% until October 8, 2018. PES provides onshore drilling services and production services to the energy companies in the U.S. and Colombia. In comparison, the SPDR S&P Oil & Gas Equipment & Services ETF saw 3.0% returns during the same period. XES tracks an index comprising of companies in the oil & gas drilling sub-industry and the oil & gas equipment & services sub-industry. ION Geophysical (IO) provides geoscience products, services, and solutions that allow upstream energy companies to obtain earth's subsurface images. Since June 29, its stock price decreased by 38% until October 8. What caused CVIA's stock price to take a dip in Q3? CVIA's management did caution about a slowdown in their Q2 2018 earnings call. The demand for proppant was expected to decline in the second half of 2018 compared to the first half. The management identified two primary drivers for the anticipated fall. One was the supply of E&P companies outpacing the drilling demand, creating an excess production in the U.S. shales. The other reason was the Permian takeaway capacity issue. The infrastructure bottleneck has temporarily moderated the growth in completions activity in that basin. Also, in the Permian, as a result of enormous drilling capacity coming in to meet demand, led to rising sand inventory levels both for sand producers as well as CVIA's customers. To reduce inventory, some of the frac sand producers started giving pricing concession on certain grades of sand, particularly in the 30/50 and on 100 mesh grades. Now, CVIA, which typically does to respond with pricing on short-term swings, saw its volume affected negatively in July. In August, CVIA too lowered its prices. So, lower volume and pricing is expected to reduce CVIA's Q3 margin. As a result of this, on September 26, CVIA reduced proppant capacity by 3.3 million tons "in response to changes in market demand". The company idled its operations in Minnesota, Missouri, Michigan, and Illinois facilities. It also reduced effective capacity at some of its other facilities. As of June 30, Covia had 43 sand mining facilities with over 53 million tons of annual sand processing capacity. How did CVIA's fundamentals look like in Q2 2018? In Q2 2018, CVIA's revenues increased 57% over Q2 2017 following higher volumes and improved pricing over the prior year period. CVIA's Q2 2018 result also includes revenues from Fairmount Santrol. Investors may note that in May, Unimin Corporation and Fairmount Santrol Holdings completed the merger and became Covia. In Q2 2018, CVIA's net debt (total debt less cash) was ~$1.5 billion. Such high debt level was the result of CVIA entering into $1.65 billion term loan in connection with the merger. 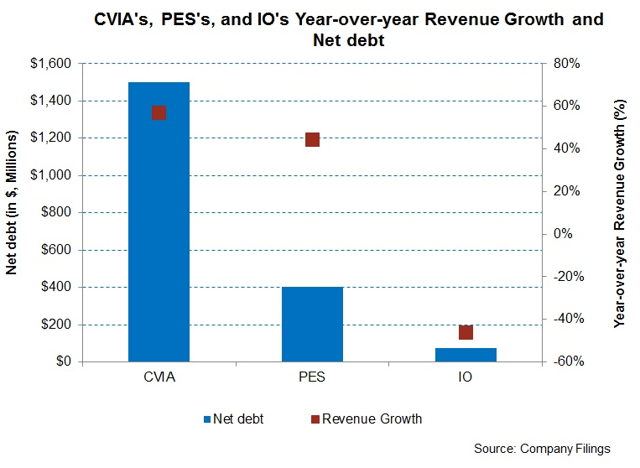 So, despite improved top line, excess capacity and high debt level have contributed to CVIA's underperformance. For further analysis of CVIA, click here. What caused PES's stock price to take a dip in Q3? In September, PES cut guidance for international drilling utilization, production services revenue, and gross margin. In a presentation, PES disclosed that it now expects international drilling utilization to decline from previous guidance of 85-87% to 76-80%. On top of that, production services revenue to fall 5-7% vs. prior guidance of a 3-5% decline. PES cut its gross margin target to 21-23% from the previous guidance of 23-25%. Earlier, in the Q2 earnings conference call, PES's management identified operational concerns that can continue to haunt PES in the near term. Pricing of boilers, which affects some of PES's rigs in providing heat to the rigs, fell off. Plus, one of PES's new build rigs from the prior build session was re-priced down pretty significantly in Q2. These may continue to affect PES's results negatively in Q3. PES also expects a decrease in demand for its small coiled pipe units and higher demand for the large type. On top of that, PES's pressure pumps are generally of lower horsepower range, while longer laterals used in the current drilling methods require higher horsepower pumps. How did PES's fundamentals look like in Q2 2018? In Q2 2018, PES's revenues increased 44% over Q2 2017 following higher revenue days and higher utilization of international drilling fleet over the prior year period. However, average margin per day decreased in international drilling for PES, negatively affecting its gross margin. In Q2 2018, PES's net debt increased 7% over a year ago. So, despite improved top line, the decline in international drilling utilization and lower demand for small coiled pipe units are the likely reasons that contributed to PES's underperformance in Q3. What are IO's short-term challenges? Delays in license round: Delays in license round announcements has negatively affected IO's new venture programs. In a new 2D multi-client program offshore Panama, the license round announcement was delayed to Q3 from Q2. Also, a 100,000 square kilometer Picanha 3D reimaging program offshore Brazil was suspended by the next couple of years. Lower demand for seismic data and services: In the recent past, oil companies shifted focus from exploration to production to minimize capital expenditures and maximize shareholders' returns. This shift caused a contraction in seismic data and services for exploration activities. Moreover, there has been a significant decline in seismic spending by the exploration & production company customers. According to IO's Q2 2018 10-Q, since early 2014, seismic contractors have taken approximately 37 seismic vessels, or about 31% of the fleet, out of the market. The continued fall has taken its toll on IO's finances. IO's Litigation concerns: Since 2009, there has been litigation between Schlumberger (SLB) and IO regarding a patent infringement regarding marine seismic streamer steering devices. On June 22, 2018, IO announced that the US Supreme Court reversed a Federal Circuit Court's determination that lost profits WesternGeco sought against IO were not available. The matter is pending to be resolved between the Court of Appeals and the Supreme Court. How did IO's fundamentals look like in Q2 2018? In Q2 2018, IO's revenues decreased 46% over Q2 2017 due primarily to delays in license round announcement and reduced activity by seismic contractors as numerous vessels have been taken out of service. In Q2 2018, IO's net debt decreased 35% over a year ago. For further analysis on IO with a long-term view, read ION Geophysical Looks Set To Overcome Its Short-Term Challenges. What are analysts' ratings for CVIA, PES, and IO? According to data provided by Seeking Alpha, four analysts rated CVIA a buy (includes strong buys), while ten recommended a hold. The analysts' consensus target price for CVIA is $13.8, which at CVIA's current price yields 80.6% returns. Four analysts rated PES a buy (includes strong buys), while five recommended a hold. The analysts' consensus target price for PES is $3.7, which at PES's current price yields only 24% returns. 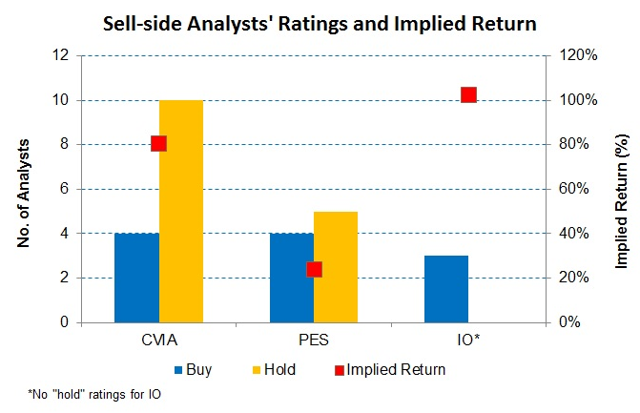 Three analysts rated IO a buy (includes strong buys), while none of them recommended a hold. The analysts' consensus target price for IO is $29.7, which at IO's current price yields 102% returns.